Where were these hoops coming from? They appear on a 1880s Thompson & Odell drum in my collection and several others I have seen. At first glance it appears the hoops are made of rosewood but upon closer inspection they are in fact formed from maple which has been stained a deep reddish color and then hand painted to imitate the woodgrain of rosewood. 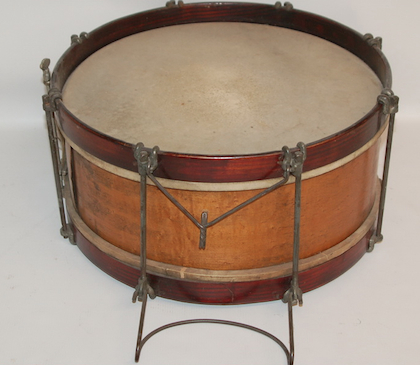 The similarities between the hoops on this Thompson & Odell drum (above) and a similar maple shelled drum by Lyon & Healy of Chicago (below) are uncanny. The hardware on the two drums pictured above is also very similar albeit somewhat generic. 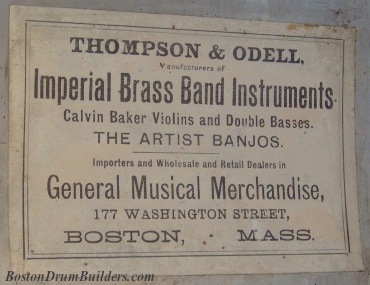 Furthermore, the wording on the Thompson & Odell label describes the company as "Importers and Wholesale and Retail Dealers in General Musical Merchandise". This all leads me to believe that Lyon & Healy of Chicago was behind the manufacture of this particular Thompson & Odell drum. 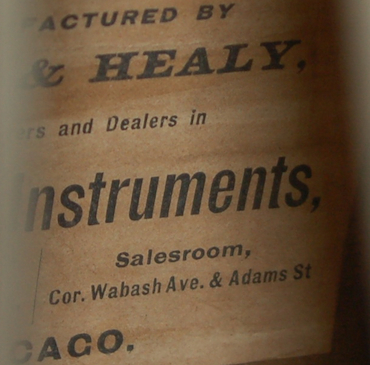 Lyon & Healy was one of the largest producers of band instruments in the late 1800s, and drums such as these often turn up with labels listing other instrument makers or music stores as is the case here. Lyon & Healy in fact proclaimed themselves to be the "largest general music house in America" and was likely a source of instruments for countless smaller dealers at the time. This certainly isn't to say that all Thomposon & Odell drums were built by Lyon & Healy because that absolutely is not the case. Drums by J. B. Treat, and Charles A. Stromberg were also dealt by Thompson & Odell prior to the Company's bankruptcy in 1905. Stromberg was in fact employed by the company for a time. But the evidence to suggest some sort of working business agreement between Thompson & Odell and Lyon & Healy is strong as the two drums pictured above demonstrate. 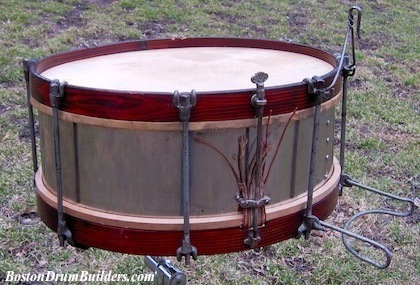 Do you have a Thompson & Odell drum? I want to to hear from you! Send Lee an email at lee@vinson.net.